CNTK - The Microsoft Cognitive Toolkit - is a unified deep-learning toolkit by Microsoft. This time we will using CNTK to run up a MNIST Classifier and test it by our selected image. Due to Microsoft didn't provide much CNTK support for C#, so the best way is start from the CNTK C#/.NET API training examples, in here you can get some code example for training/validate model and the dataset that you need for training/validate. Copy example code to get a new post not my sytle, so I will skip it, assume you already get all things complete and let the MNISTClassifier model trained done. In Microsoft's example, you can't find how to load one image and evaluate it by pre-trained model, it only show up using MinibatchSource to validate it. After very long time search and study, finally I found a way to load image to test model without make MinibatchSource. Here is my example code, at first, choose GPU as our calculate device and set model and input image's file location. Then, create a CNTK Value object from our input image. To do it, we need convert image to float array, it is not hard, but note I used Cv2.BitwiseNot to inverse image, because the dataset that we training MNISTClassifier model are black background, but our input image is white background. After input image ready, we can setup model and evaluate the result. The result will be a list of 10 value (0~9), higher value mean higher chance, we only print out top 3 result. Here is other test result. 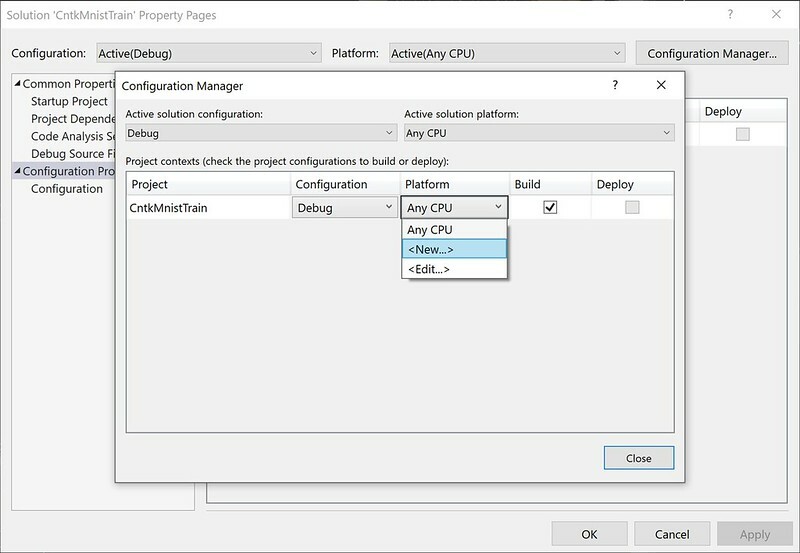 BTW, if using Visual Studio, you can get CNTK from nuget. And the solution platform need set to x64, you can setup it at here.